650 points will be rewarded to you when you buy this item. 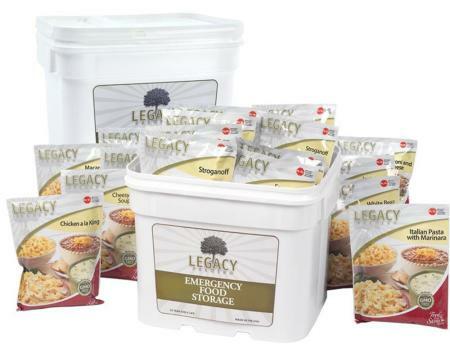 We are authorized distributors of Legacy Premium Food Products. There can be up to a 6 week turn around at times because of the high demand. If the item is out of stock or has an extended or undetermined wait time we will contact you as soon as we can to let you know your options at that time. Thank you! The 240-serving Bulk Gluten-free Entree Package provides four months’ worth of freeze-dried lunches and dinners. All of these meals are designed to be safe for those who need their food to be free of gluten. And with nine different dried food storage meals to choose from, when you have this bulk supply in your pantry, you provide your family with plenty of options when it comes time to use your food storage. The food storage industry is adapting slowly to the needs of those who have allergies or sensitivities to gluten. All along, Legacy Premium has been a leader in adjusting its offerings to meet the needs of the growing gluten-free community. The 240-serving Entree Package is one of our most popular freeze-dried offerings when it comes to gluten-free food storage. With a variety of tasty meals to choose from and up to a 25-year shelf life, Legacy’s bulk dried meal packages are the wisest choice in food storage. The 240-serving Bulk Gluten-Free Package is an excellent way to get started on food storage because it is such a compact supply of quality emergency rations. Packed in just two buckets, the entire supply can fit easily in most spaces. In addition to being easy to store, these freeze-dried gluten-free meals are also easy to prepare when you are ready to use them. All you need is boiling water and your hearty, delicious meal will be ready in under 20 minutes. 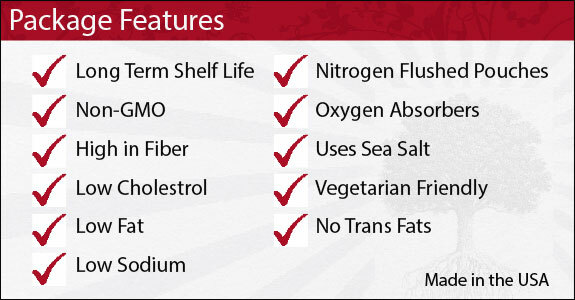 When you are looking to buy bulk emergency meals and you have family members with special dietary needs, look no further than Legacy Premium’s gourmet 240-serving Dried Entree Package. With a variety of meal options, a long shelf life, and high-quality ingredients, your emergency supply will meet your family’s needs. Compare Legacy Food Storage to any other food storage company on a cost per pound basis and you will find that with Legacy you get the best value for your money! In fact, once you compare… you will find that it’s not even close! Not all food storage is created equal. Many food storage companies can advertise low prices because they drop the calories in their meals. A great apples to apples comparison is to calculate cost per pound. This will give you a better indicator of the TRUE cost. The 240 Serving Gluten Free Entree Package from Legacy Premium includes 9 different entrees (240 servings total).